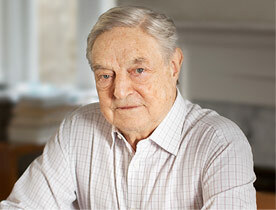 The following is a revised version of an interview between George Soros and Gregor Peter Schmitz of the German magazine WirtschaftsWoche. Gregor Peter Schmitz: When Time put German Chancellor Angela Merkel on its cover, it called her the “Chancellor of the Free World.” Do you think that is justified? George Soros: Yes. As you know, I have been critical of the chancellor in the past and I remain very critical of her austerity policy. But after Russian President Vladimir Putin attacked Ukraine, she became the leader of the European Union and therefore, indirectly, of the Free World. Until then, she was a gifted politician who could read the mood of the public and cater to it. But in resisting Russian aggression, she became a leader who stuck her neck out in opposition to prevailing opinion. She was perhaps even more farsighted when she recognized that the migration crisis had the potential to destroy the European Union, first by causing a breakdown of the Schengen system of open borders and, eventually, by undermining the common market. She took a bold initiative to change the attitude of the public. Unfortunately, the plan was not properly prepared. The crisis is far from resolved and her leadership position—not only in Europe but also in Germany and even in her own party—is under attack. Schmitz: Merkel used to be very cautious and deliberate. People could trust her. But in the migration crisis, she acted impulsively and took a big risk. Her leadership style has changed and that makes people nervous. Soros: That’s true, but I welcome the change. There is plenty to be nervous about. As she correctly predicted, the EU is on the verge of collapse. The Greek crisis taught the European authorities the art of muddling through one crisis after another. This practice is popularly known as kicking the can down the road, although it would be more accurate to describe it as kicking a ball uphill so that it keeps rolling back down. The EU now is confronted with not one but five or six crises at the same time. Schmitz: To be specific, are you referring to Greece, Russia, Ukraine, the coming British referendum, and the migration crisis? Soros: Yes. And you haven’t even mentioned the root cause of the migration crisis: the conflict in Syria. Nor have you mentioned the unfortunate effect that the terrorist attacks in Paris and elsewhere have had on European public opinion. Merkel correctly foresaw the potential of the migration crisis to destroy the European Union. What was a prediction has become the reality. The European Union badly needs fixing. This is a fact but it is not irreversible. And the people who can stop Merkel’s dire prediction from coming true are actually the German people. I think the Germans, under the leadership of Merkel, have achieved a position of hegemony. But they achieved it very cheaply. Normally hegemons have to look out not only for their own interests, but also for the interests of those who are under their protection. Now it’s time for Germans to decide: Do they want to accept the responsibilities and the liabilities involved in being the dominant power in Europe? Schmitz: Would you say that Merkel’s leadership in the refugee crisis is different from her leadership in the euro crisis? Do you think she’s more willing to become a benevolent hegemon? Soros: That would be asking too much. I have no reason to change my critical views on her leadership in the euro crisis. Europe could have used the kind of leadership she is showing now much earlier. It is unfortunate that when Lehman Brothers went bankrupt in 2008, she was not willing to allow the rescue of the European banking system to be guaranteed on a Europe-wide basis because she felt that the prevailing German public opinion would be opposed to it. If she had tried to change public opinion instead of following it, the tragedy of the European Union could have been avoided. Schmitz: But she wouldn’t have remained chancellor of Germany for ten years. Soros: You are right. She was very good at satisfying the requirements and aspirations of a broad range of the German public. She had the support of both those who wanted to be good Europeans and those who wanted her to protect German national interest. That was no mean feat. She was reelected with an increased majority. But in the case of the migration issue, she did act on principle, and she was willing to risk her leadership position. She deserves the support of those who share her principles. I take this very personally. I am a strong supporter of the values and principles of an open society because of my personal history, surviving the Holocaust as a Jew under the Nazi occupation of Hungary. And I believe that she shares those values because of her personal history, growing up under Communist rule in East Germany under the influence of her father, who was a pastor. That makes me her supporter although we disagree on a number of important issues. Schmitz: You have been so involved in promoting the principles of open society and supporting democratic change in Eastern Europe. Why is there so much opposition and resentment toward refugees there? Soros: Because the principles of an open society don’t have strong roots in that part of the world. Hungarian Prime Minister Viktor Orbán is promoting the principles of Hungarian and Christian identity. Combining national identity with religion is a powerful mix. And Orbán is not alone. The leader of the newly elected ruling party in Poland, Jarosław Kaczyński, is taking a similar approach. He is not as intelligent as Orbán, but he is a canny politician and he chose migration as the central issue of his campaign. Poland is one of the most ethnically and religiously homogeneous countries in Europe. A Muslim immigrant in Catholic Poland is the embodiment of the Other. Kaczyński was successful in painting him as the devil. Schmitz: More broadly, how do you view the political situation in Poland and Hungary? Soros: Although Kaczyński and Orbán are very different people, the regimes they intend to establish are very similar. As I have suggested, they seek to exploit a mix of ethnic and religious nationalism in order to perpetuate themselves in power. In a sense they are trying to reestablish the kind of sham democracy that prevailed in the period between the First and Second World Wars in Admiral Horthy’s Hungary and Marshal Piłsudski’s Poland. Once in power, they are liable to capture some of the institutions of democracy that are and should be autonomous, whether the central bank or the constitutional court. Orbán has already done it; Kaczyński is only starting now. They will be difficult to remove. In addition to all its other problems, Germany is going to have a Polish problem. In contrast to Hungary, Poland has been one of the most successful countries in Europe, both economically and politically. Germany needs Poland to protect it from Russia. Putin’s Russia and Kaczyński’s Poland are hostile to each other but they are even more hostile to the principles on which the European Union was founded. Schmitz: What are those principles? Soros: I have always looked at the EU as the embodiment of the principles of the open society. A quarter of a century ago, when I first became involved in the region, you had a moribund Soviet Union and an emerging European Union. And interestingly, both were adventures in international governance. The Soviet Union tried to unite proletarians of the world, and the EU tried to develop a model of regional integration based on the principles of an open society. Schmitz: How does that compare with today? Soros: The Soviet Union has been replaced by a resurgent Russia and the European Union has come to be dominated by the forces of nationalism. The open society that both Merkel and I believe in because of our personal histories, and that the reformers of the new Ukraine want to join because of their personal histories, does not really exist. The European Union was meant to be a voluntary association of equals but the euro crisis turned it into a relationship between debtors and creditors where the debtors have difficulties in meeting their obligations and the creditors set the conditions that the debtors have to meet. That relationship is neither voluntary nor equal. The migration crisis introduced other fissures. Therefore, the very survival of the EU is at risk. Schmitz: That’s an interesting point, because I remember that you used to be very critical of Merkel two years ago for being too concerned with the interests of her voters and establishing a German hegemony on the cheap. Now, she has really changed course on the migration issue, and opened the door wide to Syrian refugees. That created a pull factor that in turn allowed the European authorities to develop an asylum policy with a generous target, up to a million refugees a year with the target open for several years. Refugees who are qualified to be admitted could be expected to stay where they are until their turn comes. Soros: But we don’t have a European asylum policy. The European authorities need to accept responsibility for this. It has transformed this past year’s growing influx of refugees from a manageable problem into an acute political crisis. Each member state has selfishly focused on its own interests, often acting against the interests of others. This has precipitated panic among asylum seekers, the general public, and the authorities responsible for law and order. Asylum seekers have been the main victims. But you are right. Merkel deserves credit for making a European asylum policy possible. The EU needs a comprehensive plan to respond to the crisis, one that reasserts effective governance over the flows of asylum seekers so that they take place in a safe, orderly way, and at a pace that reflects Europe’s capacity to absorb them. To be comprehensive, the plan has to extend beyond the borders of Europe. It is less disruptive and much less expensive for potential asylum seekers to stay in or close to their present location. My foundation developed a six-point plan on this basis and announced it at exactly the same time as Orbán introduced his six-point plan, but the two plans were diametrically opposed to each other. Orbán’s plan was designed to protect the national borders against the asylum seekers; ours sought to protect the asylum seekers. We have been at odds ever since. Orbán accuses me of trying to destroy Hungary’s national culture by flooding the country with Muslim refugees. Paradoxically, our plan would keep qualified asylum seekers where they are currently located and provide facilities in those places; it is his policies that induce them to rush to Europe while the doors are still open. Schmitz: Could you make your paradox a little clearer? Why would your plan prevent refugees from flooding Europe? Soros: We advocate a common European asylum policy that would reassert control over the European rather than national borders and allow asylum seekers to reach Europe in a safe, orderly way, and at a pace that reflects the EU’s capacity to absorb them. Orbán advocates using the national borders to keep out migrants. Schmitz: And who is winning the conflict? Soros: In Hungary, he has won hands down. More disturbingly, he is also winning in Europe. He is challenging Merkel for the leadership of Europe. He launched his campaign at the party conference in September 2015 of the Christian Social Union of Bavaria (the sister party of Merkel’s Christian Democratic Union) and he did so in cahoots with Horst Seehofer, the German party chairman. And it is a very real challenge. It attacks the values and principles on which the European Union was founded. Orbán attacks them from the inside; Putin from the outside. Both of them are trying to reverse the subordination of national sovereignty to a supranational, European order. Putin goes even further: he wants to replace the rule of law with the rule of force. They are harking back to a bygone age. Fortunately, Merkel has taken the challenge seriously. She is fighting back and I support her not only with words but also with deeds. My foundations do not engage only in advocacy; they seek to make a positive contribution on the ground. We established a foundation in Greece, Solidarity Now, in 2013. We could clearly foresee that Greece in its impoverished state would have difficulty taking care of the large number of refugees that are stuck there. Schmitz: Where would the money for your plan come from? Soros: It would be impossible for the EU to finance this expenditure out of its current budget. It could, however, raise these funds by issuing long-term bonds using its largely untapped AAA borrowing capacity. The burden of servicing the bonds could be equitably distributed between member states that accept refugees and those that refuse to do so or impose special restrictions. Needless to say, that is where I remain at odds with Chancellor Merkel. Schmitz: You have retired from running your hedge fund and devote all your energies to your foundation. What are your major projects? Soros: There are too many to enumerate. We seem to be involved in most of the burning political and social issues of the world. But I would single out the Institute for New Economic Thinking (INET) and the Central European University (CEU) because there is a revolution going on in the social sciences and I am deeply involved both personally and through my foundations. With the help of the natural sciences, mankind has gained control over the forces of nature but our ability to govern ourselves has not kept pace with the achievements of natural science. We have the capacity to destroy our civilization and we are well on the way to doing so. Schmitz: You paint a bleak picture of our future. Soros: But it is a biased view and deliberately so. Recognizing a problem is an invitation to do something about it. That is the main lesson I learned from the formative experience of my life, in 1944, when the Nazis occupied Hungary. I might not have survived if my father hadn’t secured false identification papers for his family (and many others). He taught me that it’s much better to face harsh reality than to close your eyes to it. Once you are aware of the dangers, your chances of survival are much better if you take some risks than if you meekly follow the crowd. That is why I trained myself to look at the dark side. It has served me well in the financial markets and it is guiding me now in my political philanthropy. As long as I can find a winning strategy, however tenuous, I don’t give up. In danger lies opportunity. It’s always darkest before dawn. Schmitz: What’s your winning strategy for Greece? Soros: Well, I don’t have one. Greece was mishandled from the beginning. When the Greek crisis originally surfaced toward the end of 2009, the EU, led by Germany, came to the rescue, but it charged punitive interest rates for the loans it offered. That is what made the Greek national debt unsustainable. And it repeated the same mistake in the recent negotiations. The EU wanted to punish Prime Minister Alexis Tsipras and especially his former finance minister Yanis Varoufakis at the same time as it had no choice but to avoid a Greek default. Consequently, the EU imposed conditions that will push Greece into deeper depression. Schmitz: Is Greece an interesting country for private investors? Soros: Not as long as it is part of the eurozone. With the euro, the country is unlikely ever to flourish because the exchange rate is too high for it to be competitive. Schmitz: How concerned are you that in the middle of all these crises an important EU member state such as the UK is considering leaving the European Union? Soros: Very. I am convinced that Britain should stay in Europe not only for economic but even more for political reasons. An EU without the UK would be a much weaker union. Schmitz: But surveys show a British majority for a Brexit, or British exit from the EU. Soros: The campaign for the Brexit has deliberately misled the public. Currently, Britain has the best of all possible deals with Europe. It has access to the common market where nearly half of UK exports go while it is not weighed down by the burden of having joined the eurozone. Schmitz: Why is the British business community not more vocal about the disadvantages of a Brexit? Soros: The managements of the multinational corporations that have built up their manufacturing capacity in Britain as a springboard into the common market are reluctant to say that they oppose a Brexit publicly because they don’t want to get embroiled in a political debate where their customers have divergent views. But ask them privately, as I did, and they will readily confirm it. The Brexit campaign has tried to convince the British public that it is safer to stay out of the common market than to be part of it. The campaign had the field to itself because the government wanted to give the impression that it is holding out for the best deal. Schmitz: For a long time, Europe—and the world—could count on China as a growth and credit engine. Soros: China is still historically the most important country. It still has very large accumulated foreign currency reserves. Schmitz: And that will shelter the country? Soros: China is exhausting these reserves very rapidly. It also has an incredibly large reservoir of trust from the Chinese population: many people may not understand how the Chinese regime actually works, but they believe that a regime that has managed to overcome so many problems knows what it is doing. But the reservoir of trust is also being exhausted at a remarkably fast rate because the leadership has made many mistakes. President Xi Jinping can carry on with his current policies for another three years or so, but during that time, China will exert a negative influence on the rest of the world by reinforcing the deflationary tendencies that are already prevalent. China is responsible for a larger share of the world economy than ever before and the problems it faces have never been more intractable. Schmitz: Can President Xi rise to the challenge? Soros: There is a fundamental flaw in Xi’s approach. He has taken direct control of the economy and of security. If he were to succeed in a market-oriented solution it would be much better for the world and for China. But you cannot have a market solution without some political changes. You cannot fight corruption without independent media. And that’s one thing that Xi is not willing to allow. On that point he is closer to Putin’s Russia than to our ideal of an open society. Schmitz: What is your assessment of the situation in Ukraine? Soros: Ukraine has done something almost unbelievable in surviving for two years while facing so many enemies. But it needs a lot more support from outside because it’s exhausted. By putting Ukraine on a short financial leash, Europe is repeating the mistake it has made in Greece. The old Ukraine had much in common with the old Greece—it was dominated by oligarchs and the civil service was used by people who were exploiting their position rather than serving the people. But there’s a new Ukraine that wants to be the opposite of the old Ukraine. The Rada has recently passed a budget for 2016 that meets the conditions imposed by the IMF. Now is the time to hold out the prospect of the additional financial assistance that the new Ukraine needs to carry out radical reforms. That would enable the country not only to survive but to flourish and become an attractive investment destination. Turning the new Ukraine back into the old Ukraine would be a fatal mistake because the new Ukraine is one of the most valuable assets that Europe has, both for resisting Russian aggression and for recapturing the spirit of solidarity that characterized the European Union in its early days. Schmitz: Many criticize US President Barack Obama for being too weak toward Russia. Soros: Rightly so. Putin is a supreme tactician who entered the Syrian conflict because he saw an opportunity to improve Russia’s standing in the world. He was ready to keep pushing until he encountered serious resistance. President Obama should have challenged him earlier. If Obama had declared a no-fly zone over Syria when Russia started to supply military equipment on a large scale, Russia would have been obliged to respect it. But Obama was eager to avoid any chance of a direct military confrontation with Russia. So Russia installed antiaircraft missiles and the US had to share control of the skies over Syria with Russia. You could almost say that by shooting down a Russian fighter jet, Turkish president Recep Tayyip Erdoğan did Obama a favor. Putin had to recognize that his military adventure had run into serious opposition and he now seems ready for a political solution. That is promising. There is also ISIS and the terrorist attacks that threaten to undermine the values and principles of our civilization. The terrorists want to convince Muslim youth that there is no alternative to terrorism, and if we listen to the likes of Donald Trump they will succeed. Schmitz: I can’t help but ask. Do you know Trump? Soros: Going back many years Donald Trump wanted me to be the lead tenant in one of his early buildings. He said: “I want you to come into the building. You name your price.” My answer was, “I’m afraid I can’t afford it.” And I turned him down.